Remove the tires and wheel assembly. Refer to Tire and Wheel Removal and Installation. Remove the park brake cables from the rear axle. Refer to Parking Brake Cable Replacement. Cap the rear brakes lines so as to prevent the hydraulic brake system from being contaminated. Remove the rear brake line from the rear axle. Refer to Brake Pipe Replacement. Relocate the rear brake assembly to the side using mechanics wire. Remove the rear wheel bearing/hub from the rear axle. Refer to Rear Wheel Bearing and Hub Replacement. Using a hydraulic jack stand, support the rear axle assembly. Using a bright colored paint, mark (1) the outline of the rear axle mounting bracket to the chassis to properly align the rear axle to the chassis for installation. Before removing the spring and insulator's, note the relationship of the spring and insulators to the body and the rear axle. Lower the rear axle and remove the rear springs and the insulators. Refer to Rear Spring, Insulator, and Jounce Bumper Replacement. 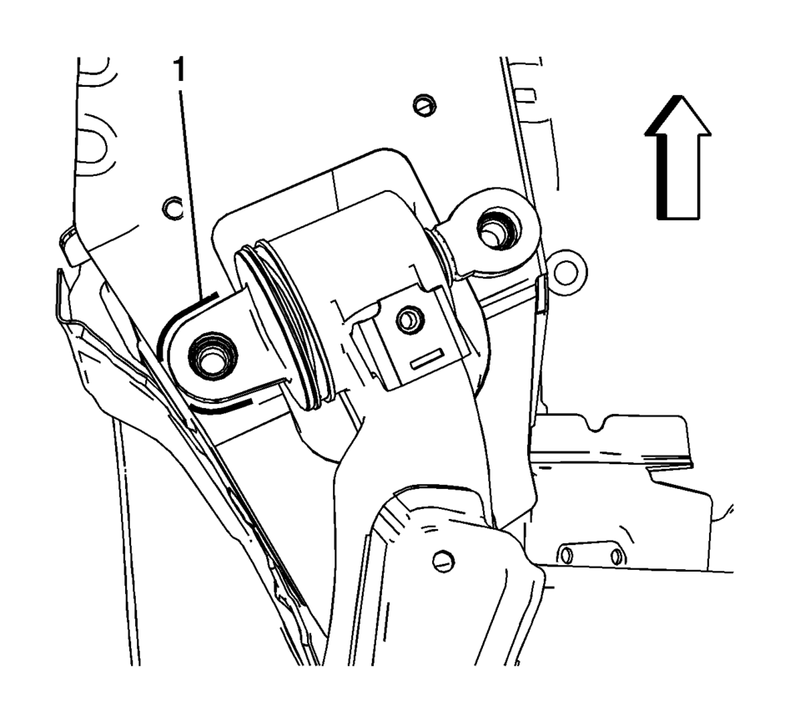 DO NOT remove the rear axle mounting bolts at this time. Loosen the mounting bolts (1) for the rear axle. With the aide of an assistant, remove the mounting bolts. With the mounting bolts removed, lower the rear axle assembly (1). 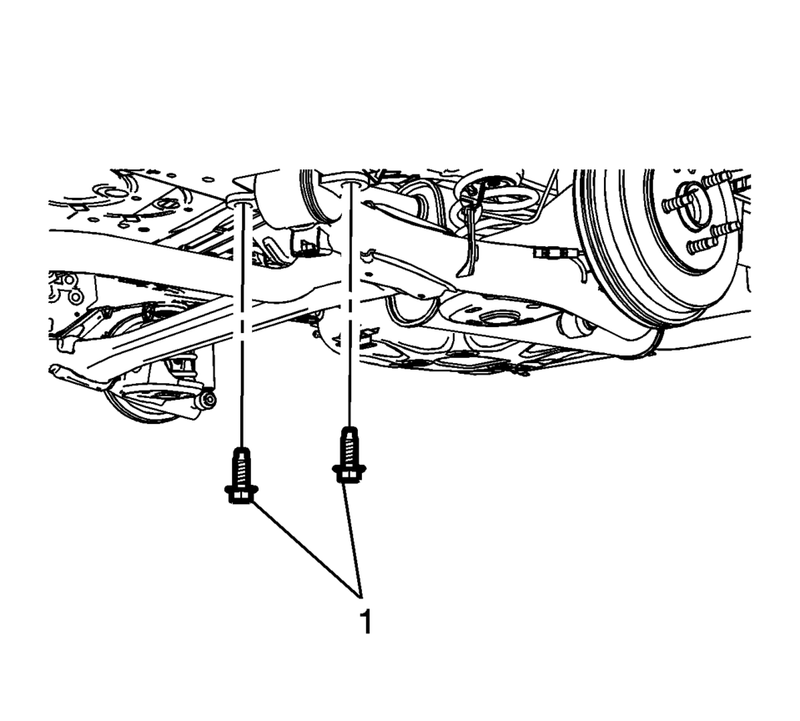 Using a hydraulic jack stand and the aide of an assistant, position the rear axle assembly (1) in the vehicle. Align the mounting points of the rear axle to the painted outline (1) on the chassis. 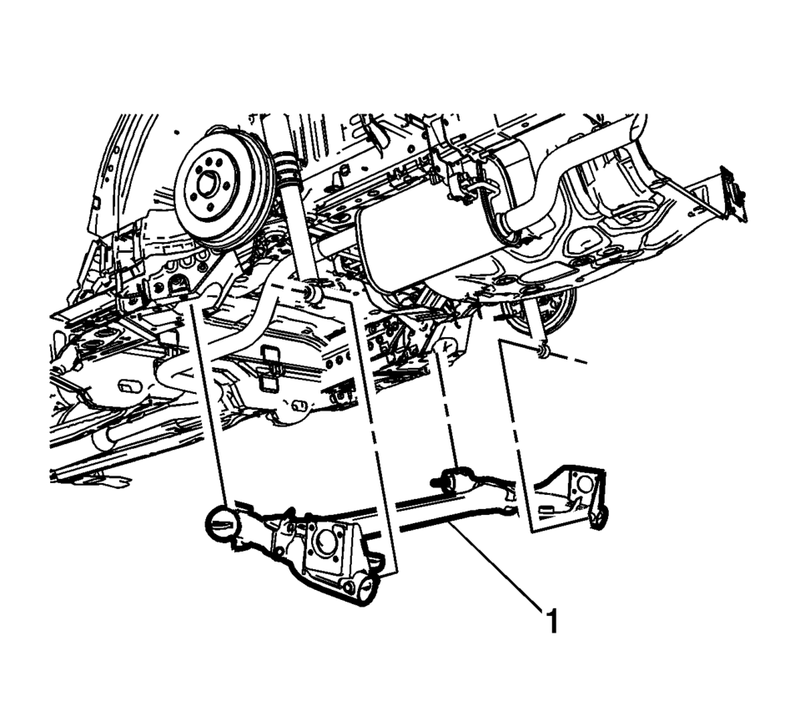 Ensure that the rear springs and insulators are properly aligned seated in the rear axle. Install the rear spring and the insulators. Refer to Rear Spring, Insulator, and Jounce Bumper Replacement. Install the rear wheel bearing/hub mounting bolts to the rear axle. Refer to Rear Wheel Bearing and Hub Replacement. Install the rear park brake cables. Refer to Parking Brake Cable Replacement. Install the rear brake lines on the rear axle. Refer to Brake Pipe Replacement.